Preheat oven to 400 degrees. Rub chicken all over with oil, season with salt and pepper to taste and dried herbs. Add 2 tablespoons butter to a large skillet over medium heat, once melted stir in honey. Place chicken in the pan and brown 2-3 minutes on each side. Transfer to a plate and set aside. Add butter and garlic to the pan and stir over medium heat 1-2 minutes until browned and fragrant. Stir in broth and cream. Bring liquid to a boil and simmer for 5 minutes. Stir in salt and pepper to taste (I used about 1/4 teaspoon salt and a pinch of cracked black pepper) and juice of 1/2 lemon (about 1 tablespoon). Thinly slice remaining half of the lemon and set aside. Rub chicken all over with oil, season with salt and pepper to taste and dried herbs. Add 2 tablespoons butter to a large skillet over medium heat, once melted stir in honey. Place chicken in the pan and cook 5-7 minutes on each side until cooked through. Transfer to a plate and cover to keep warm. Add asparagus to the pan, cook for 5-7 minutes, turning the asparagus every couple of minutes, until tender. Transfer to the plate with the chicken, cover to keep warm. Add butter and garlic to the pan and stir over medium heat 1-2 minutes until browned and fragrant. Stir in broth and cream. Bring liquid to a boil and simmer for 5-10 minutes until reduced by half and thickened enough to coat the back of a spoon. Stir in salt and pepper to taste (I used about 1/4 teaspoon salt and a pinch of cracked black pepper) and juice of 1/2 lemon (about 1 tablespoon). Add chicken and asparagus back to the pan, cook 1-2 minutes til hot throughout. 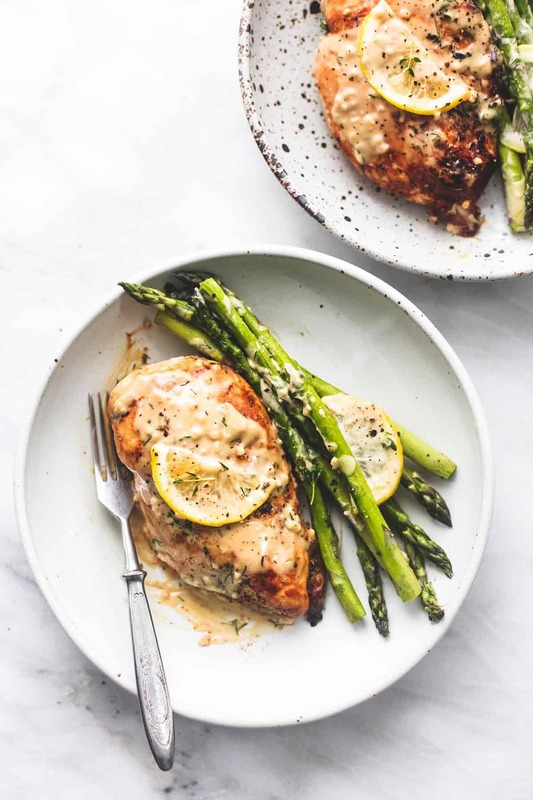 Spoon pan sauce over the chicken and asparagus and serve. 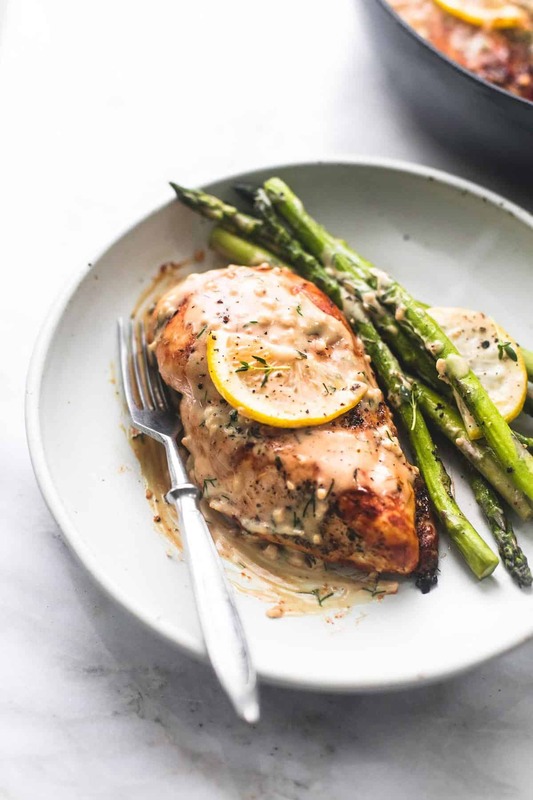 **For extra creamy sauce: Reducing the sauce down further (simmering longer until thickened) before adding asparagus and returning chicken to the pan will result in a thicker, creamier sauce. 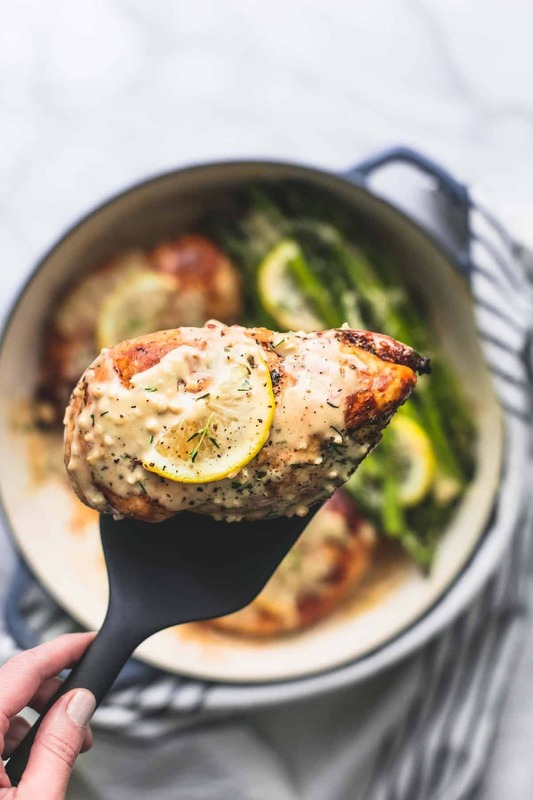 You can also whisk 2 teaspoons of corn starch into 1 tablespoon of chicken broth and stir this into the simmering sauce for an even thicker, ultra-creamy lemon pan sauce. 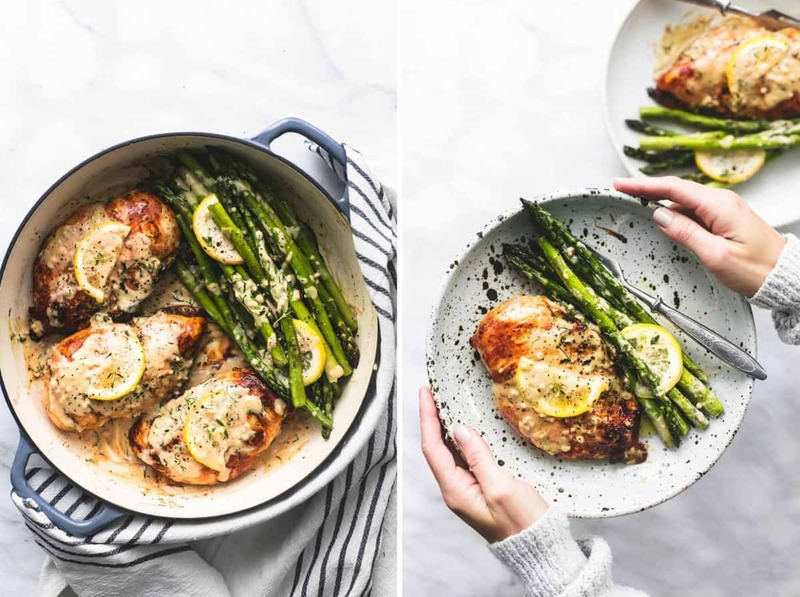 More One Pan Meals You'll Love! 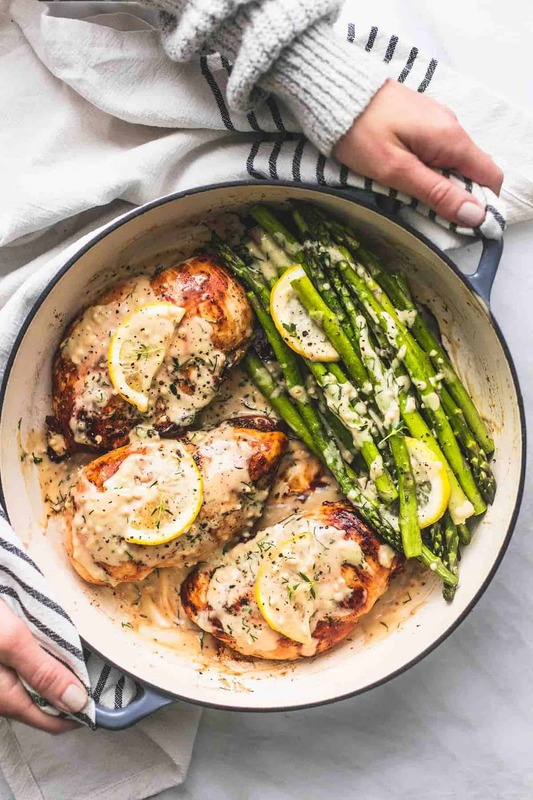 Can this be cooked in a glass pan? I love your RECIPEs. 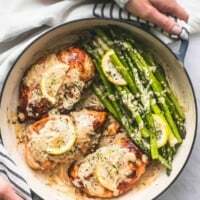 Can you tell me what kind of skillet you Purchased for the lemon and chicken one pot meal? None of mine can go in the oven. Typically all of my oven safe skillet’s are cast iron! They can be found at numerous places, even target! They carry a few cheaper ones that are great! WHERE does it state what to do with the other TBSPS OF BUTTER? Hi Michelle, thanks for pointing out that error- it is fixed. It goes in Step 2 with the garlic! It tasted great but My sauce was very Thin what do you think i did wRong?i felt like i followed the recIpe exactly. 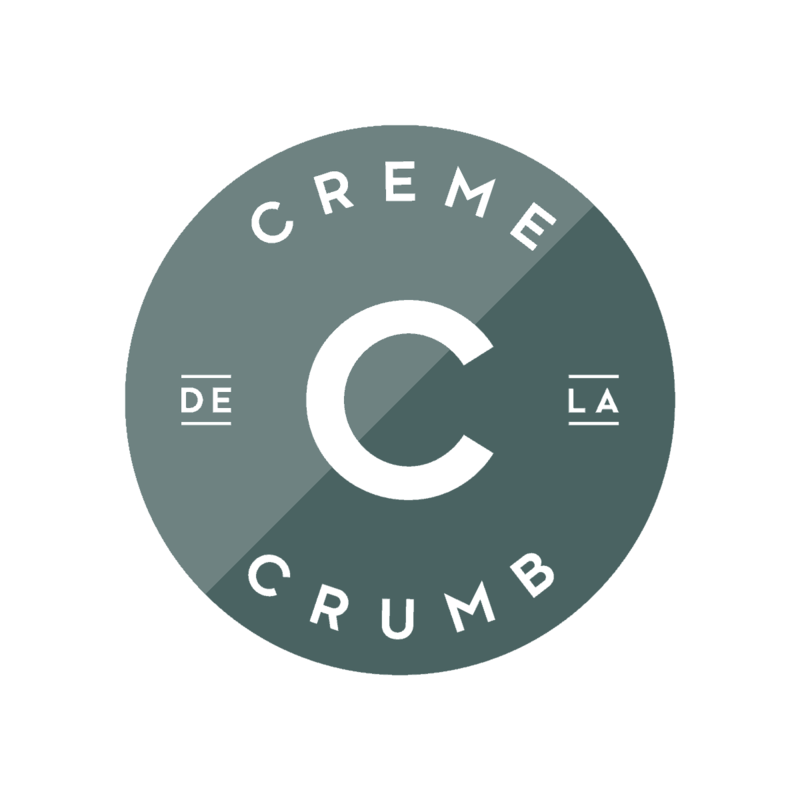 It should come out creamy as written but I have added a small additional step to make sure that you get the same results as I did! I Made this for dinner tonight and the flavors were So good! My sauce was pretty thin though. It looked like in the picture your Sauce was thicker, is that right? If so, do you have any suggestions? It should come out creamy as written but I have added a small additional step to make sure that you get the same results as I did! I am happy to hear that you enjoyed the flavors of this recipe, Kath! Thanks for your feedback. THis turned our DELICIOUS. It felt like a special OCCASION meal that only took 30 minutes to make. would DEFINITELY make this again! It turned out perfectly in my Le Creuset dutch oven. This dish was delicious! My husband and i were literally drinking the sauce out of the pan after we’d served ourselves our portion and came back for seconds. Thank you for this recipe! I will make it again for sure! i made this for dinner the other night and it was truly one of the best things I’ve made in a while! my boyfriend even sneakily licked his plate when we were done. I did find that my sauce was pretty thin too, even though I followed the updated directions. Has anyone found a way to thicken it up a bit, besides going the ol’ corn flour route? i’m already looking forward to making this again–Thanks, Tiffany!! Way to go, Meghan! Thanks for your feedback. I laughed out loud about your boyfriend licking the plate, haha!